We provide our range of services in the Galway region of Ireland with little to no lead time and total reliability guaranteed with every service delivery. Our services include Onsite Paper Shredding, Offsite Paper Shredding, Document Destruction, Product Destruction, IT & Media Destruction and Recycling Services Nationally in Ireland. We pride ourselves in our professionalism and strive to achieve total customer satisfaction through high level of security, confidentiality and customer care. We have a 100% unblemished track record since our establishment in 2004. Not only do we provide our services at a cost effective rate but we provide our service to the highest standards within Ireland. We provide our high security confidential onsite paper shredding in Galway and across the Island of Ireland. We provide all of our clients with full traceability through our certificates of destruction and recycling in order to provide peace of mind and satisfy any audit upon the client. Our Clients confidential paper documents are shredded with our innovative onsite technologies which are operated by our specially trained helpful staff. The confidentially shredded paper material is fully recycled in order to return to Ireland in the form of paper products such as Paper Towels, Paper Egg Cartoons and Cardboard. The in-house designed Onsite Paper Shredding technology is unique as it is operated with fully automated methods of shredding. This imperative aspect of our technology guarantees that the client’s confidential paper waste is not visual to our staff nor is it touched during the entire process. This impressive system is simply the most secure, efficient advanced technology being utilised within Ireland. The whole process is recorded in-time through our on-board camera and our clients can witness the it via our on-board VDU screen. This innovative design of our paper shredding technology further increases the level of security and confidentiality of our onsite paper shredding service delivered to our clients throughout Ireland and the Galway Region. Clients within Ireland and the Galway Region interested in our onsite can also avail of our innovative offsite paper shredding service. 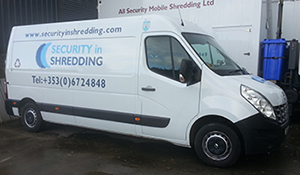 Our offsite paper shredding service entails our high security paper collection vehicles and expertly trained staff arriving at the client’s premises to collect the client’s confidential paper documents in order to enter our innovative confidential shredding process at our secure facility. We have designed and implemented our “Same Day Shred” policy for all offsite collections. This “Same Day Shred” policy provides our clients with total peace of mind that their confidential documents are destructed the same day as collection. This policy yet again increases the level of security within our offsite paper shredding service. With this we provide all of our clients with Certificates of Destruction and Recycling which provides the client with a full guarantee and traceability of their material while verifying that their confidential paper is destroyed during every service delivery. Everything we provide to clients is specifically tailored for our their varied requirements in order to maximise security, satisfaction and efficiency which in turn benefits our clients as they can continue with their daily responsibilities. With our innovative scheduled onsite paper shredding service and our scheduled one is provided nationally in Ireland and Galway. Our clients can also avail of our clear out option within their region. The clear out can cater for clients across the Island. Many of our clients with confidential paper waste production require annual clear outs in order to clear space, move office premises and/or clear end of year accounting that has been stored for the required period of time and our clear out option accurately meets their requirements. No job is too big or too small for us, as the client is always number one and achieving total customer satisfaction is our goal. With all of our products, we provide the additional features to all clients that is expert knowledge and advice in relation to confidential paper management. We are fully aware of the risks involved with data protection and the costs associated with breaches of data protection in addition to consulting and with this in mind we provide our expertise knowledge to our clients in order to help them with their needs. For further information on our offsite confidential paper shredding service in the Galway Region please do not hesitate to contact us. Clients that require our expertise and ones in the surrounding areas can sometimes find it difficult to ensure compliance through hiring European certified vendors. There are many aspects that require specific compliance requirements in order for the client to be sure that they are not at risk of negligence in the case of a data breach. An example of this is that a vendor should only have the secure destruction process as their only activity on their site with all separate activities if there are any to be separated. The main reason for this is to separate general waste and recycling companies from certified data destruction. With these complicated aspects of choosing a certified Company, clients can experience a great deal of stress when trying to establish true compliance for their processes. With stringent legislation for Data Protection in addition to further data protection legislation coming from Europe it is essential for organisations in the Galway region to hire paper shredding companies that satisfy their legislative requirements in addition to minimising risk of negligence. Our customers can be rest assured that when disposing of outdated data there are many reputable compliant companies available to them and the most important thing is compliance with legislation and risk minimisation for a their data during the process. Whether you require an Offsite paper shredding or Onsite, our team of dedicated staff will ensure that you have a pleasant and informative experience when completing the job. Please do not hesitate to call our client care team and they will provide you with the relevant information to ensure that you are in compliance with European Legislation and not at risk of negligence with no obligations to our document destruction services.